Seiko is Japanese company manufactures watches, clocks, electronic devices, semiconductors and other optical products. Seiko is Japanese word meaning “exquisite” or “success”. The company was founded in 1881 as a small jewellery and watch store called ‘K. Hattori’ by Mr. Kintarō Hattori in Ginza area of Tokyo. 11 years later in 1892, he began to produce clocks. And later in 1924, the first watch produced under the brand name of Seiko. Seiko introduced world’s first quartz watch in 1969 and later introduced first quartz chronograph as well. At one time Seiko was famous for making watches entirely in-hose. This includes not only major items like microgears, motors, hands, crystal oscillators, batteries, sensors, LCDs but also includes items such as oils used in lubricating, luminous compounds used in the hand and dials. Even today, the movements are made in their own plants in Japan and their subsidiaries in China, Malaysia and Singapore. The fully integrated in-house production system is still practised for high-end luxury watches in Japan. Talked too much about the company. Now let’s see it’s collections in brief. *Note: Images are for representation. It may vary. Mostly shown the design patterns, other colour variations available in actual collection. Let's explore the Seiko Watch Collection one by one. Seiko Premier watches, where classic inspiration meets modern expression. A great collection of dress watches for ladies and gents both that embraces latest technology and architectural design. See some of the classic watches from the collection below. Upper three are of gents and below three are of ladies. Seiko Sportura is collection of sports watches for both ladies and gents. It features big calendar chronographs for sports timing, kinetic direct drive movement and tachymeter and offers 100m water resistance. Sportura offers all those who love sports the watch that fits their every need. Seiko Coutura includes classic bracelet watches in variety of single and multi-colour tones. The perfect classic round shape case with date display, Seiko Coutura dress watches are perfect for everyday wear and with the party wear. Velatura is built for ocean. It is the watch partner of 49er Class. 49er Class is the fastest boat in the Olympic regatta. Velatura is designed to meet the requirements of the finest sailors in the world. Velatura gents’ watches are perfect sports watches for outdoor fun. While ladies watches are designed with elegance to complement your everyday look. As I have stated in introduction para, Grand Seiko enjoys the tag of fully integrated in-house watches. The collection includes quartz calibre 9F, mechanical calibre 9S, spring drive calibre 9R and spring drive chronograph calibre 9R86 series. Grand Seiko watches are symbol of high accuracy, legibility and reliability. See watches from each collection below. Seiko Astron, the world’s first GPS solar watch. Astron watches are solar powered and equipped with low-energy GPS receiver which receives and update time, time zone, day and date data according to the location. Few glimpses from the collection see below. Last one is Novak Djokovic limited edition watch. Seiko Ananta combines the craftsmanship of Katana (the ancient Japanese art of sword making) and Seiko’s cutting edge technology. Ananta is the ancient Sanskrit word for infinite. 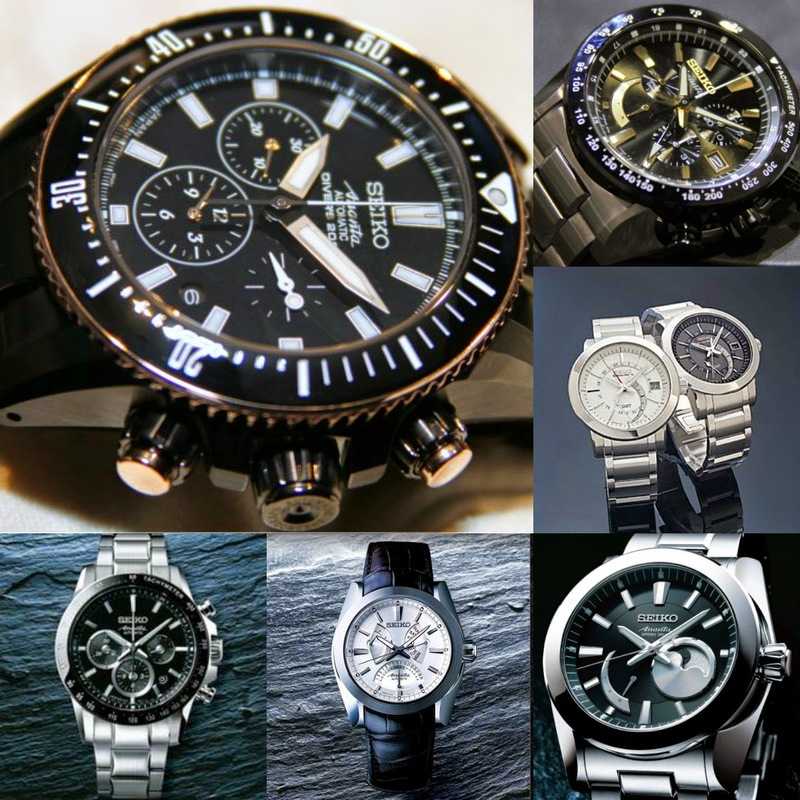 Seiko Ananta watches are sports watches with finest level of perfection and highest level of quality. Prospex, another great collection of Sports watches from Seiko. Prospex watches are perfect for outdoor fun like adventures activities, sports activities, on the sea or beach with water it performs uninterrupted in any condition. All Seiko’s sports watch expertise in one collection. So overall Seiko is in competition with other Japanese watch makers like Casio and so their collections justifies Seiko’s existence. Seiko watches again remind us the expertise of Japan in technology and innovation.